Build relative paths to anywhere within your project using here::here(). This post extends on the problem and on these two solutions. The document you are reading now is an rmarkdown document using the default working directory. Notice that it has a different notion of woking directory compared to the project’s working directory. Now notice that here::here() gets is right. 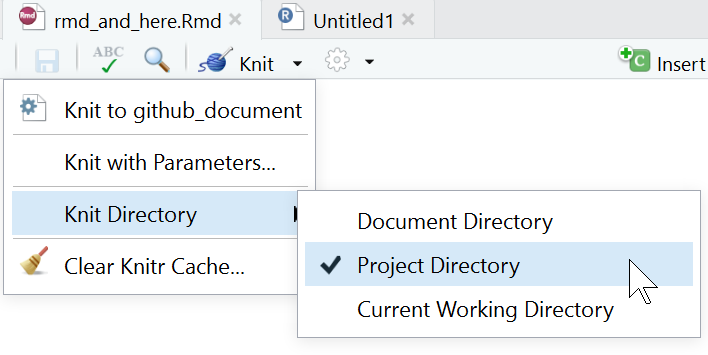 You can use RStudio to change this setting from Document directory to Project directory. But be careful, this setting goes back to its default every time you rename or move the rmarkdown file – so you may need to repeat this step. 2. Build relative paths to anywhere within your project using here::here(). Alternatively, you can leave the default untouched and build relative paths using here::here().